Interpack 2017 was a resounding success! The event was well attended, busy and had a strong global presence. It provided an opportunity to share the latest and greatest innovations as well as observe the latest news in the industry. 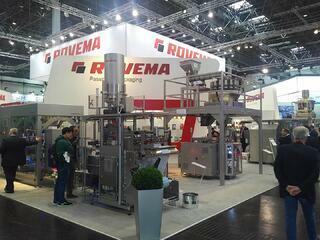 Based on all the information we gleaned at Interpack, it was clear that this is an exciting time for packaging. Technology, innovation and futuristic thinking are propelling us to make changes in the way we think of and utilize packaging. It is fascinating. From all that we learned and shared at this stimulating event, I'd like to provide the top trending observations from Interpack 2017. This was a major focal point, mainly due to the news that a large retailer is encouraging vendors to move from Bag in Box to flexible packaging. After Walmart released the sustainable packaging playbook for suppliers in 2016, it was inevitable that there would be a shift toward reducing secondary packaging. With the clear goals of optimizing design, source sustainability and supporting recycling, this playbook marks a major shift in the way companies will be packaging their product. While some pouches may not be recyclable, the EPA has noted that flexible packaging has a green footprint when looking at overall environmental impact. Also, transitioning to flexible packaging in regards to a stand up pouch or pillow bag provides notable source reduction benefits. Can the product be changed to reduce overall packaging needs (e.g., concentrating, dimension changes)? Are there extra layers or components that are unnecessary? Can the size, weight, or thickness of the package be reduced? Is the case count optimized? Are there unnecessary empty spaces within the package? Can reusable packaging be used? Has the transport packaging been considered? For larger packages, is there a way to include a handle so a bag doesn’t need to be used to carry it home by the customer? Shelf-Ready Packaging, also known as Retail-Ready Packaging, is another huge push by Walmart. We started to see a move toward this a decade ago, but it appears to be gaining momentum. People typically associate SRP with German discount chains such as Aldi and Lidl. The low cost these stores provide are appealing to consumers and is made evident by their growth. SRP is a factor in allowing these costs to be consistently low. A common concern is the transition and cost associated with the move to SRP. In a 2015 interview, Chet Rutledge who was then Walmart’s director of private packaging, provided some keen insight regarding packaging cost in relation to SRP. We love the Ropack (Rovema’s version of a Doy style pouch). One of its biggest drawbacks, however is that it does not offer as much fill room as a Flat Bottom or Stabilo (Quad Seal). This was an interesting and accurate point that was brought up by multiple people who visited our booth. Depending on your product, fill space can be a top priority and therefore, a Doy style stand up pouch may not be the best solution. Thankfully, there are other types of stand up pouches that do offer this value. Another notable point is that the Stabilo stand up pouch, with its four-corner seals, provides the rigidity and is a great alternative to the Bag in Box. 4. Trending Topic #4 Sustainability! Sustainability is mentioned everywhere and applies to so many key aspects in economics and the packaging world. The World Commission on Environment and Development describes this as “A process of change in which the exploitation of resources, the direction of investments, the orientation of technological development and institutional change are all in harmony and enhance both current and future potential to meet human needs and aspirations. Sustainability is a key focal point because we are aware, as individuals and businesses, that our actions today have consequences that have far reaching effects into the future. And we want those consequences to be positive. Not only does sustainability play a part in costs (monetary and otherwise) today, but it plays a part in cost for future generations. 5. Trending Topic #5 Industry 4.0 – Making machines smarter. Industry 4.0, or the fourth industrial revolution, involves many areas and is a topic that can be discussed ad nauseum. It involves communication and connectivity, functionality, machine intelligence and more. One aspect of Industry 4.0 involves the Internet of Things. The IoT encompasses the connectivity and inter-networking of devices, electronics, building, machinery, etc. This smart grid can provide real time feedback, increase OEE, troubleshoot and prevent mechanical failure, and improve plant safety. User-friendly HMI’s are also prevalent in Industry 4.0. With easy-to-ready dashboards and intuitive menus, the new HMI designs enable operations to flow smoothly and with less frustration. Finally, the focus on a smart machine allows clear communication of the expected life-cycle of certain machine parts and preventative maintenance needs. Similar to a car display that lets you know how many miles you have before you run out of gas or when you need to change your oil, some HMI features point out when you will need maintenance on various parts. While these changes have been gradually taking place in the last decade, it feels like we are at the cusp of seeing these advances permeate the industry more thoroughly and quickly. Interpack 2017 showed us insights into what is happening now and what can happen in the future. Let us know what you learned at Interpack by commenting below!